Students gather in the quad to honor the 17 students killed in Florida. In response to the Douglas High School mass shooting in Florida that occurred on February 14, a nationwide protest was called for a 17 minute walkout by teachers and students. Students around the world marched to show they are done with the current gun laws in the United States that make it easy to access weapons at a young age. “I think that if one school does it, it doesn’t really do much, but all these schools across the country, if more and more start doing it there isn’t really a way that people who are high up won’t hear about it,” said Greer Greenberg, a freshman. 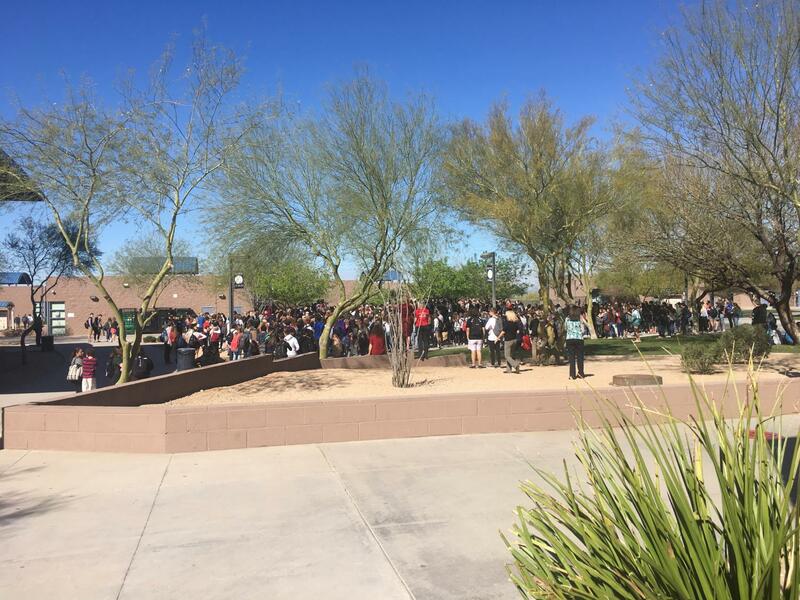 Students at Cactus Shadows participated in the 17-minute walk out and gathered in the quad, where organizers spoke about school shootings and read the names of each student who died in Florida. This was followed by a minute of silence. Whether or not guns are the problem is in debate among citizens. Gun control is believed to help make it harder for individuals to purchase a gun and many think it may reduce the murder rate in the United States. In some opinions, gun control should not be enforced because guns are a form of self defense. “I think gun control is probably one of the stupidest ideas ever made. The idea of banning something for criminals not to get a hold of is the same as banning drugs. You ban drugs there’s still a drug problem, so if you ban guns there’s still going to be a gun problem,” said Ryland Davidson, a freshman. In some states, students are being threatened with suspension for walking out. Taken from NewsWeek, a Texas School district will suspend a student for three days if they decide to protest.